1Instituto de Física Rosario (IFIR), Universidad Nacional de Rosario (UNR), CONICET, Facultad de Ciencias Bioquímicas y Farmacéuticas, Facultad de Ciencias Veterinarias, 2000 Rosario, Santa Fe, Argentina. 2Facultad de Ciencias Exactas, Universidad Nacional de La Plata (UNLP), B1900AJJ La Plata, Buenos Aires, Argentina. 3Universidad Nacional de Quilmes (UNQ), CONICET, Laboratorio de Investigación en Funcionalidad y Tecnología de Alimentos (LIFTA), Departamento de Ciencia y Tecnología, B1876BXDBernal, Buenos Aires, Argentina. *To whom correspondence should be addressed. E-mail: jorge.wagner@unq.edu.ar. Received 05 March, 2018; Received in revised form 02 April, 2018; Accepted 06 April, 2018. Protein aggregates, Surface properties, Structural properties, Soy-whey proteins. 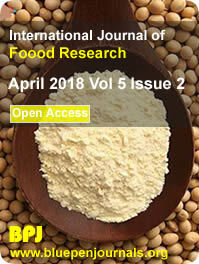 In this study, the impact of isolation conditions on structural and surface properties at the air/water interface of soy-whey proteins (SWP) was assessed. SWP were obtained by precipitation of soy-whey (at pH 4.5 or 8.0) with acetone or ammonium sulfate. Despite the fact that all SWP samples exhibited similar electrophoretic patterns, they showed different protein content (from 54.2 to 98.2% w/w). When precipitation was performed at pH 4.5, SWP samples evidenced a decrease of protein solubility (SP) and thermal stability, while the precipitation with acetone promoted the enrichment in polysaccharides and minerals. For all samples, intrinsic fluorescence, surface hydrophobicity and Fourier transform infrared (FTIR) studies revealed structural changes correlated to protein unfolding and aggregation processes. However, the surface behavior can be predicted from these studies mainly due to differences in surface hydrophobicity and the differential contribution of insoluble aggregates. The heating of SWP samples enhanced the surface activity, regardless of the pH of the raw material and the isolation method. These results can be useful as a reference research and as a starting point for industrial exploitation of proteins from soy wastewater.